At Fancy Pants Party Rentals we do fun with style. We specialize in the best and most unique inflatable bounce houses in West Bloomfield, Commerce, Waterford, Farmington, Novi, Northville, Livonia and its surrounding areas. Our bouncers, moonwalks and inflatable water slides will simply amaze. We are here to provide the best service available. If you are in need a special themed bouncer, feel free to call us and let us know. We will try our best to make you wishes come true. 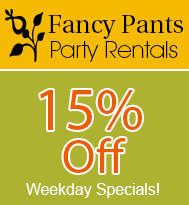 Let Fancy Pants Party Rentals make your next party the best party ever. Check out our selection of exciting bounce houses and inflatable slides to delight your guests. movie theater tasting popcorn try out our professional popcorn poppers. Learn how our concessions rentals keep your guests coming back for more. Relax in comfort and style at any party or event. Discover the convenience of our table and chair rentals to meet the needs of your guests. At Fancy Pants Party Rentals we pride ourselves on having the cleanest bounce houses and inflatables around. We don't mess around, all of our bounce houses are sanitized with Matt-Kleen™ prior to each event to prevent the transmission of germs and ensure you and your guests peace of mind. Take the stress out of setup and removal with our help. Prior to your event, We will come out to the site and professionally install the bounce house. 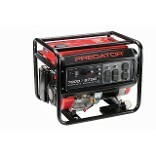 We provide all necessary equipment including extension cords, stakes, tarps and even a WATCHDOG™ Blower-Siren. What is the WATCHDOG™ Blower-Siren? A revolutionary patented safety device which connects to the blower and monitors for common problems such as extension cords coming undone, circuit breakers popping, or kids shutting down or unplugging blowers... if there's a problem, the WATCHDOG™ will let you know with its built-in 120-decibel siren in just seconds! Planning on having your event outdoors but do not have electricity to power the inflatables blower, we have 7000 watt generators for rent. Monday - Saturday, 9:00 a.m. – 7:00 p.m.
Providing Services around West Bloomfield, Commerce, Waterford, Farmington, Novi, Northville, Livonia and most of Oakland County in Michigan. Let us bring the party to you. We will deliver and safely set up any bounce house, moonwalk and water slide. We will Deliver and and instruct in usage of cotton candy machines, pop corn machines and snow cone machines. We provide driveway/garage drop off and pickup for tables and chairs. We deliver to West Bloomfield, Commerce, Waterford, Farmington Hills, Novi, Northville and surrounding communities. Please contact us about delivery in your area.